In 1990 I published a book entitled The Fruits of Fascism (Cornell University Press), in which I attempted to offer a compelling and novel thesis. I argued that the different degrees of success enjoyed by the Ford Motor Company's subsidiaries in Britain and Germany in the 1930s and 1940s were heavily influenced by the policies of each country's government. Ford in Britain was then favored by a government seeking to encourage foreign investment in order to boost the nation's floundering manufacturing base. The British government often gave Ford preferential treatment, especially when it vocally complained about the allocation of scarce wartime resources. Such allocations enabled it to support its widespread claim that it acted as the "arsenal of democracy" for the wartime Allies. In contrast, Ford had continual problems in Germany, fueled by growing German nationalism, from the time it established a presence in that country in 1925. (The German subsidiary was renamed Fordwerke in 1939.) For instance, when a new plant was constructed in Cologne in 1931, the business faced immediate criticism because its owners were Ford's American company and British subsidiary, most of its directors were foreigners, and its exports were limited. The advent of a Nazi government in 1933 only exacerbated Ford's problems with nationalist sentiments in Germany. The company became alarmed by slumping sales and responded by trying to placate the Nazi government. But it remained an isolated and marginalized business, despite Hitler's personal admiration for the anti-Semitism of Henry Ford (1863-1947) and the mass production techniques Ford had made famous. Ford's foreign ownership meant that it lacked the "authenticity" and "credibility" of other businesses; furthermore, Ford lacked the size and, thus, the strategic importance of Opel, General Motors' German subsidiary. Ford was treated by the Nazi government as "the producer of last resort" when it came to the allocation of government contracts. Ford's very existence in Nazi Germany was constantly threatened by low sales to a nationalistic general public and by the fear that the government would confiscate its facilities. If my account was correct, then how could an article appear in the Washington Post (March 5, 1998) declaring that Ford had been the "arsenal of fascism" rather than the "arsenal of democracy" -- thus staining an appellation that the company had sported with pride? Why, five decades after the end of the Second World War, is Ford (like GM) accused in a lawsuit (initiated on March 4, 1998) of using slave labor in its German subsidiary in the Forties, and of gaining "unjust enrichments"? 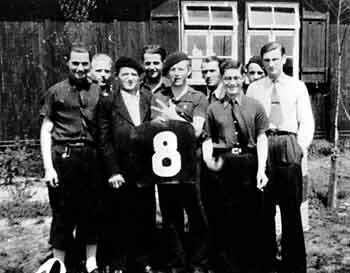 To what extent -- if any -- and in what ways, did Ford in Germany cooperate with the Nazi regime? And, if it did, what motivated such cooperation: racist ideology, or a concern for corporate profitability? The Ford Motor Company responded to the lawsuit and the attendant public scrutiny by appointing an investigative team made up of historians and professional archivists whose mandate, company officials promised, was to provide an uncompromising assessment and report about Fordwerke's wartime activities. I was hired, in November 1998, as a consultant; my role was to assist investigators in locating relevant material, to read and comment upon the research team's findings, and to provide "correctives" to any misplaced assumptions that the team adopted. I continue to work in that role at this point, acting as an informed and critical outsider rather than as an intrinsic member of Ford's efforts. While my participation probably raises questions about my objectivity (and, more generally, about whether scholars should be paid for such work; in my own case the general suggestion of a lucrative windfall has been grossly exaggerated), I believe that the skills and knowledge that scholars supply to companies that find themselves in Ford's position are truly indispensable for clarifying past conduct. 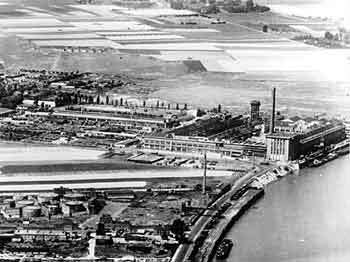 Some aspects of Fordwerke's policies are largely undisputed: slave laborers were used at its Cologne plant between 1941 and 1945. So were prisoners of war and foreign laborers, mostly from Eastern Europe and the Soviet Union, but also from France and Italy. But I had written about this a decade ago and discussions then about my findings had not progressed beyond academic circles. So why has this issue been raised now? I believe that financial considerations are not the motives of the former slave laborers who are now suing Ford. For many, I suspect, justice, recognition and accountability are of paramount importance. I am sympathetic to them because my own parents were Viennese refugees, and many members of my family were victims of the Holocaust -- including three of my four grandparents. I am also sympathetic because the former slave laborers are paying a price in coming forward now, because, by doing so, they have to relive the painful horror of their wartime treatment in public. Faced with the passage of time, many of the individuals suing Ford -- and many men and women who endured similar adversity -- feel that history has given insufficient legitimacy and credence to their suffering. For them, the lawsuit is an instrument to ensure that their past afflictions will be recognized and acknowledged both in the history books and by the general public. The timing of the suit is not accidental. It is occurring in a particular period: many aging Holocaust survivors are dying, and Germany's political leadership and citizenry appear determined to relegate the Holocaust to the margins of their society's consciousness. Germans label this process "normalization." The Germans want to exchange physical monuments for the uncomfortable and protracted public discourse that they must currently endure. The cost of the latter on the national psyche is enormous and debilitating. In the Thirties, the management of Ford's German subsidiary felt so threatened by the hostility of the Third Reich that it consistently sought to ingratiate itself with the Nazi regime in order to keep the company viable. The importance of the government's good will for the Ford subsidiary's prosperity cannot be overstated; it became apparent as early as 1936, when Ford in Germany was denied certification as a national producer, a certification necessary if it was to be awarded government contracts for manufacturing. With such contracts steadily growing to constitute the vast majority of all sales in Germany, denial of certification was a grievous blow to the subsidiary. The subsidiary's management knew that the road to economic salvation meant submitting to government demands, even if that meant lying to or limiting contact with the Dearborn head office. 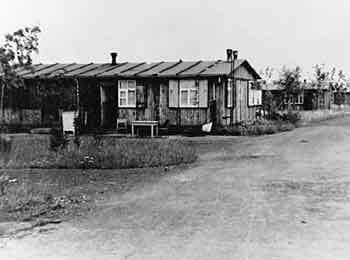 Postwar photograph of forced labor barracks at Ford-Werke plant in Cologne. The company's managers at Cologne also feared for their own individual jobs -- feared that they would be replaced by political appointees. So Cologne's management attempted to assuage the Nazis' concerns about their and the company's loyalties in at least three ways. First, they introduced a racial criterion for the hiring of management staff. Foreign and Jewish members of the subsidiary's management board were removed, despite, interestingly, the strenuous opposition of Henry Ford. The first time that a Jewish manager was fired (in 1936), Ford himself was successfully able to reverse the decision. Subsequently, however (certainly by 1940), control of the subsidiary effectively shifted to Cologne, and Ford was unable to thwart further dismissals. 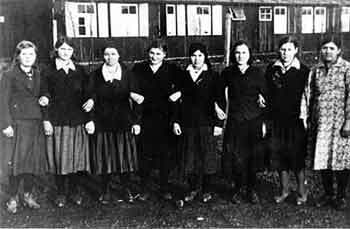 Second, the Nazi government, before the war, wanted to increase the import of raw materials that were in short supply. It also limited Ford's access to the raw materials it did have (generally, rubber). The company attempted to appease the Nazi regime and relieve its own shortages by importing as much scarce raw material as possible. Finally, the Nazi government desperately needed foreign currency to fund the purchase of raw materials. Ford in Germany responded by attempting to maximize the export of its finished products -- negotiating with U.S. and U.K. Ford in order to secure profitable export markets. The company's German managers hoped that a favorable outcome for these ventures would mean that the German government would look upon their business more positively and that success would save their jobs. Who was in charge of Fordwerke when it used slave labor (it is now generally accepted that this occurred between 1941 and 1945)? By the time that slave labor was introduced, Fordwerke was clearly under the direct control of the Nazi government, though administered through the company headquarters in Cologne (albeit by Robert Schmidt). The meetings of the board of directors had already been suspended, and didn't resume until after the war. Although the American parent company desperately sought to retain control of their German assets, they failed to do so. Fordwerke became an instrument of the Nazi state. I certainly found no evidence that American management ever sanctioned the use of slave labor or that it even knew of the use of slave labor. Did Fordwerke materially benefit from its economic activities in Nazi Germany, particularly during the period when it employed slave laborers? Here, the arcane nature of old German accounting systems, the contestable methods by which destruction of property is calculated, and the means by which the losses of trade due to war are determined, all become vitally important. I personally have found little evidence that Fordwerke made money during the war. The net-profit figures I have uncovered reveal that while modest profits were recorded during the first few years of the conflict, these were wiped out by enormous losses during the last three years. Fordwerke received compensation from the Nazi government for bombing damage in 1941. But a 1942 German law denied such recompense to businesses whose majority ownership was held by foreigners from hostile nations. In 1967, the Foreign Claims Settlement Commission of the U.S. Congress made a compensatory award to Ford for its German subsidiary's wartime losses after extended negotiation and deliberation. The gross figure was almost $1.1 million. This award for damages stands as important evidence of Ford's claim that it did not enjoy "unjust enrichment" in Germany during the war, and that it did not profit, even inadvertently, from the use of slave labor. Even if this figure is only approximately accurate, when coupled with the profit and loss figures I located, it appears that there were no Fordwerke "profits" to share with the victims of slave labor. The current management of the Ford Motor Company has publicly asserted that its investigation of Ford's relationship with the Third Reich will be comprehensive, honest and objective. I will be the first to criticize the company publicly if it suppresses information and does not address the claims of those who were slave laborers for Fordwerke. I have seen no evidence to date that Ford has been behaving irresponsibly in its scrutiny of its conduct in the Thirties and Forties. Simon Reich is a professor at the Graduate School of Public and International Affairs at the University of Pittsburgh. He is the author of The Fruits of Fascism: Postwar Prosperity in Historical Perspective (Cornell University Press, 1990) and the coauthor of The German Predicament: Memory and Power in the New Europe (Cornell University Press, 1997).